Some gifts are just destined to become keepsakes. That’s especially true of Precious Metal Prints custom-imprinted pendants. 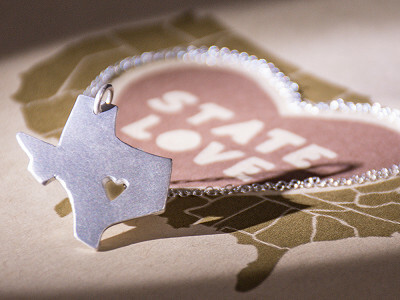 These custom charms are the brainchild of Precious Metal Founder, Grant Barton. Wanting to give his wife a gift she’d treasure forever, Grant used some special clay to take impressions of his son’s fingerprints. Using that as a mold, he handcrafted a pendant that his wife could wear as a necklace. It received so many compliments, a business was born. Today, Precious Metal Prints are still handcrafted in Knoxville, TN from a mold you make yourself using certified-safe clay the company sends you. Simply take an impression of your loved one’s fingerprint—or nose print, if your loved one is of the 4-footed variety—and mail the kit back to Precious Metal. In a couple of weeks you’ll receive your custom charm on a shining chain—a wonderful, personalized gift that belongs close to your heart. If I need a replacement thumbprint kit for the Precious Metal Prints mold ASAP, what's a good alternative? EasyMold from Michael's Craft Stores is a great alternative. Just try to get a good thumbprint in there! Hello everyone! I'm proud to introduce Precious Metal Prints to The Grommet. I'd be happy to answer any questions you have! So these are 10k gold or what type of 'precious' metal? @Cindy they are gold vermeil, which is 24k gold plate over fine silver. Silver pendants are fine silver. Fine silver is 99.9% pure silver. Thanks for the question! is this pendant large enough for a cat paw print? @patricia Paws are typically too large to make into a pendant. Kitten print? Or is there a certain dimension we should keep in mind? What is the actual dimension of the pendant? Hi Janet and Joyce, the pendant is 0.75" x 0.5" x 0.05" so that is the space you have to work with. Any other ideas other than fingerprints and pet snouts? How big is the clay for impressions? 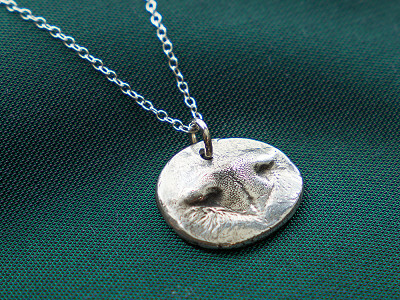 @Janis At this point we are only offering pet nose and fingerprint pendants on the grommet. If you have a particular product in mind that you'd like to see on the grommet, please let them know and we will see what we can do! Will individual charms be available, in the near future? @Sharon Each of the products listed on the grommet are individual charms. Yes, it is, Bob, but you will have to buy two kits then combine them! Is it STERLING silver? Or nickel silver? @Laura the pendants are made using fine silver (99.9% pure). Sterling silver is 92.5% pure. There is no nickel in the pendants. Thanks! @Jane the price is the same for multiple pendants from the same impression. The completed pendant will be slightly smaller than the impression that you send in to us. Thanks! My son passed away in August. I do have a mold with his hands in it. I also have plain paper with his fingerprints. Is there a way to make a pendant from these? Hi Laura, I am so sorry for your loss. There actually is a way to make a pendant from those. I will pass this along to Grant directly to ensure you get it. @Mike Thank you so much. 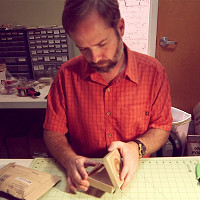 Mike: I would like to get the same info on how to make a pendant from a plaster mold of a hand. would it be possible to put my son's name on the back of the pendant? His name is Daniel. @Trudy It's unlikely that we would be able to fit 6 letters on the back of the pendant. We are able to stamp 3 initials and this is included with the pendant. Thanks! Hi. Can you have the back of the pendant engraved? Also, what is the price for 3 pendants on one necklace? Thanks so much! @Allie stamping of up to 3 initials is included with each pendant. For 3 pendants, you will need to purchase 3 kits. Each will come with a necklace that you can use with something else or keep as a spare. Two questions: First how long is the necklace itself? I need at least a 20"inch necklace and is the chain silver if we order a sterling service pendant? 2nd: Is the chain sturdy enough if we wish to have two pendants - (I'm looking at my husband's fingerprint and my son's). Awesome idea! @AnnMarie the included sterling silver chain is 18" long. We have had customers wear as many as 4 pendants on the chain. Thanks for the compliment! Is is possible to have one fingerprint on one side and a second fingerprint on the other side? @Robert each pendant can have a fingerprint on the front and up to 3 initials on the back. Thanks! 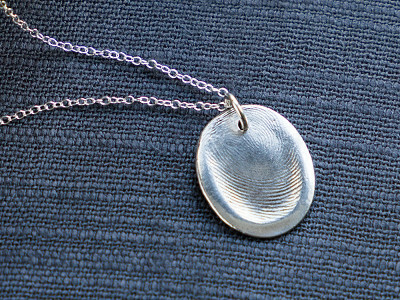 I have grave concerns about carrying a fingerprint around on a pendant - if lost it could pose a huge security risk for anyone whose place of work uses fingerprint scanning for access to restricted areas (military, laboratories, some financial institutions). 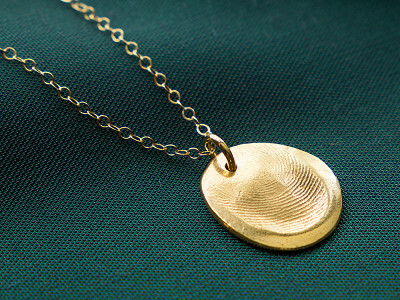 Do you know whether these pendants could be read by a fingerprint scanner? Hi Jeff, thanks for the question. I'll let Grant comment on whether they can be read by a fingerprint scanner, but as a rule of thumb, I would suggest anyone whose prints are used for high-security clearance like the examples you mentioned, exercise extreme caution when wearing Precious Metal Prints. @Mike and Jeff: I'd have to agree with Mike, use caution if your loved one works in a high security environment. 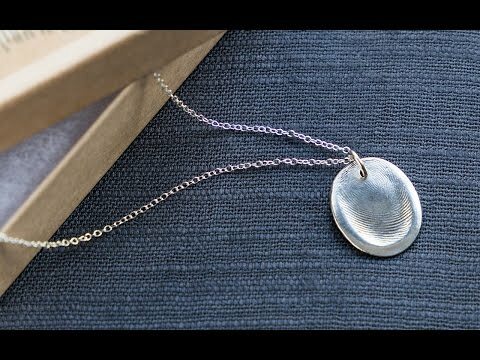 Hi Grant ...just wondering if it is possible since I have two kids to put one fingerprint on either side of this pendant (for extra charge of course) so that both of their fingerprints are on one pendant? @KB our process of making pendants does not allow for a fingerprint on both sides of the pendant. Thanks! We live out of the country, but would love to be able to do something like this for Grandma. Can we get a kit to the UK, and then send the finished product direct to Grandma in the US? Hi Kristiana, yes, it is very possible. I'll reach out to you directly with more info! Can the pendants be used as a charm on a charm bracelet? Or are they too big for a bracelet? @Jennifer they look great on a charm bracelet! Can I order multiple charms? I would like to do a necklace with a charm for each of my kids....would I have to buy multiple kits? @Herinka you would need to order a kit for each child's impression. Thanks! Hi there. The only fingerprint I have from my father is on a piece of paper. It is actually a thumbprint. Can a necklace be made from this? 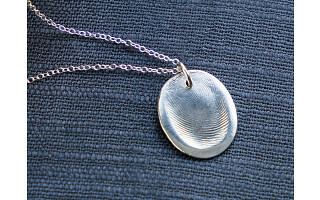 @Jennifer unfortunately we have to use a physical impression to make the fingerprint pendants and are unable to use an ink print on paper. @Jennifer I believe you can check with your local funeral home, they do these charms from a print on paper. I think my dog's nose is as big as a cat's paw which you said would be too big. How does that work? Is there a size limit? @Nancy it shouldn't be a problem. Please note that for larger dogs, the pendant will be a portion of the nose and is unlikely to include all of the nose. Can you reproduce these finger prints from birth certificates.? I have a family that passed away and it is all I have. Thank you. @Deborah unfortunately we need a physical impression to make our pendants and are unable to use ink on paper. The video on The Grommet website just shows how to make a fingerprint impression. I'd love to see how you obtain one from a dog's nose. I can't imagine they like it very much! It's a great idea and I love the look of your dog nose example but I'm not sure how I'd get an impression from my chihuahua. @Deborah luckily, it is a very quick process and takes less than a second to take the impression. You will be using a two part silicon mixture that hardens after about 15 minutes. Hi Karen, you can connect with Grant via our Customer Experience team here. I see that the gold and silver are the same price. Is the gold only plated? @Grant, opps, I didn't notice that it said starting at $79.95. But what is gold vermeil? @Tamara gold vermeil is fine silver (99.9% pure) plated with 24k gold. What happens if my dog won't hold still to get a good print? I paid the money and I won't have anything to show for it. @Joyce let us know if you have any problems and we will be happy to get an extra mold kit out to you. Grant: I want order three (3) identical pet nose imprint necklaces. Will I receive three clay molds, and send all three back, or just send back one? @John yes, you will need to order 3 kits. Thanks! Isn't this the same as thumbies? Where you can add messages and dates to the pendants, rings, money clips, etc. @Tara, have you checked out the price of thumbies? These are much more affordable and every bit as beautiful. Hi. I LOVE the pet nose pendant. But my dogs nose is 2" wide east-west by 1 1/2" long north-south. Will the kit accommodate this size or do you have a larger kit size? @Linda we will make your pendant using the area between and slightly above your pup's nostrils. We do not offer a kit for a larger pet nose pendant at this time. Thanks! Can you please explain the exact process for obtaining the nose print? Are you actually encouraging people to smear their dogs noses with silicone? @Michelle the pet nose pendant kit uses the same material that is used in making custom hearing aids and in ear headphones. You simply mix the two part material per the included instructions, quickly press it to your pet's nose (it takes less than a second) and set it aside to solidify for approximately 15 minutes. Thanks for the question! Hey Grant, sorry if you've already addressed this or similar issue... These are great pieces, especially for Moms. On that note, would you offer discounts on multiple prints for one order and arrange on one chain? Also, are the finished pieces able to be engraved on the reverse and do you offer that service? Hi Andy, thanks for the comment and kind words! Unfortunately for multiple prints on one chain, you will have to buy multiple kits, but we will look into discounts in the future. The pendants can have a fingerprint on one side and three initials on the other. Hope this helps! Hi Grant we have 2 children is it possible to do two pendants on one necklace? What is the limit of the size of the dogs (golden retriever) nose?